We’re proud to partner with nearly 8,500 independent tire shops across the United States. 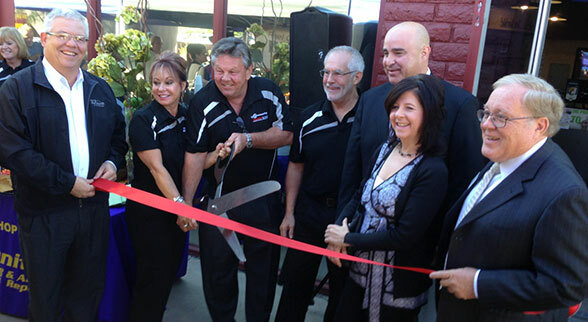 Today, we’re introducing you to Howard and Pat Fleischmann, owners of Community Tire Pros in Phoenix, Arizona. In 2013, their six-store chain was named Tire Review’s Top Shop — the best tire dealer in North America. Read on to find out why the Fleischmann’s home phone number appears on their business website (! ), why their shops have “gorgeous” bathrooms (see the photo for proof), and why Community Tire Pros has so many happy customers. How long have you been in business? Since 1945. Community Tire Pros started as Charlie Case Tire and we changed the name to Community Tire Pros in 2003. How did you get into the tire business? I started out in 1971 as a technician and then moved into the auto parts replacement industry. I got into tires because I saw a great opportunity. Today I primarily manage our brand – the technicians won’t let me near cars! I work on my ’55 2-door Chevy Bel Air at home though. What services do you provide? We do everything except paint and body. We employ at least one ASE Master Certified Technician in each of our stores, and all of our technicians are ASE Certified. Our Master Technicians can diagnose any problem. Do you specialize in anything particular? Customer service! We never let a customer leave without feeling better than they did when they came in to our shop. Ours is a basic and simple business – fix it right the first time at a fair price, and you’ll have a customer for life. Around here we like to say, “We advise, you decide.” We spend time teaching our staff how to really listen to customers and hear what their challenges are. Often, when there’s an issue, it’s because we didn’t hear what was said in the beginning. We give our store managers carte blanche to make any decision necessary – the only bad decision is no decision. And it works! We have very high customer satisfaction and retention. Do you have any special equipment, certifications, awards, etc. that people should know about? We have the High-Mile Club, which is a way to reward customers who properly maintain their high-mileage vehicles. We give these customers a free oil change and gift certificates toward future services. It’s a great tool for customer retention! What’s your customer service philosophy? I make sure that if there’s a problem, the customer tells me how we can make it right. Any dispute is usually due to communication. They never ask for more than I’m willing to give. I put myself in the customer’s shoes, and believe that perception is reality. If I can see things from their point of view, I’ll give them what they want and keep them coming back. I am so committed to customer service that I list my cell phone and my home phone number on our website. Really? How many times has a customer called you at home? Only 3 times in 10 years! One was a complaint, but two were compliments, and in both cases they were calling to see if the phone number was real. What’s one thing customers don’t know about maintaining their car? Read your owner’s manual! All service guidelines for the vehicle are in the owner’s manual. If you read your owner’s manual and service your car regularly, you can keep vehicle expenses to a minimum. What makes your business unique? My wife, Pat. She’s the Director of First Impressions. Pat has designed the interiors of all our stores, with an emphasis on being female friendly. 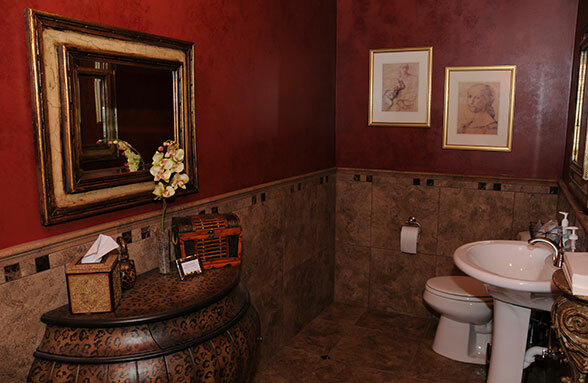 Our bathrooms are gorgeous! We also involve our staff anytime we remodel a shop. Their involvement translates to them caring more and protecting the shop. We send birthday cards to our employees, and any time a customer compliments one of our employees by name we send the employee a $25 gift card and a personal thank you card. Can you tell us a story about a memorable customer experience? The Highway Patrol called us one day to let us know a woman with two small children had blown a tire and gotten stuck on the freeway less than a mile from our shop. As it turns out, she was on her way to California to meet her husband, who was returning from Iraq. We got the car to our shop to find one tire blown, and two about to go. We wanted to help, and were ready to give her a set of tires for free. Once we looked under the hood, we found the car was in need of a brake job and some additional work that you could tell she wasn’t prepared to pay for. A customer in the waiting room had overheard us, and came up to the counter and said “You fix it, we’ll pay for it.” We were able to get her car running smoothly and she was so grateful. Is there anything else you want people to know about your shop? 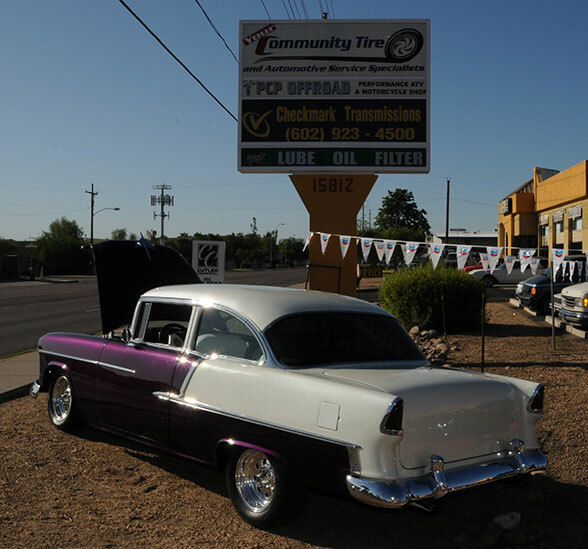 Community Tire Pros is the best-kept secret in Arizona! And thanks to our affiliation with Tire Pros, we have the best tire warranties, too! I always appreciate a gorgeous bathroom, especially in a tire shop! That’s so unexpected! I would definitely go there to get my tires installed.